Single-cell whole genome amplification is the highly preferred product type in the global market. Advances in primer technologies and lysing techniques have led to more reliable andaccurate whole cell genome amplification. Single cell WGA is used to examine the sequence information with the optimized next generation sequencing technologies, only from a single cell. This method is considered to be a powerful tool that helps to understand the ins and outs of genetics by bringing the entire genome structure to a cellular level. Since this method offers a high-resolution view of the genomic sample, its adoption will continue to be on the rise in diverse biological fields such as microbiology, immunology, neurobiology, cancer research, and tissue mosaicism. Single cell WGA plays a crucial role in conveying new applications to the market. Moreover, screening for a variety of developmental and neurological genetic disorders is heavily dependent on single-cell WGA. These experiments are conducted with an RT-PCR utilizing specific WGA PCR kits. GenomePlex WGA4 kits from Sigma-Aldrich are among a few kits on the market specifically designed for single-cell WGA. Most other kits can be used for either single cells or, more commonly, pool of cells. Leading companies that are dealing in single-cell kits are Sigma-Aldrich (in association with Rubicon Genomics), QIAGEN NV, and GE Healthcare. According to the market forecast recently provided by Future Market Insights, single-cell WGA Kits are projected to reach a market value of over US$ 2,000 Mn by the end of 2028. There is an increase in the safety rules and legislations which is expected to improve accuracy and efficiency significantly. It is also intended to avoid false positivity of whole genome amplification and boost the quality of diagnostic services. To focus more on safety, the U.S. FDA has provided a guideline such as 510-K. This section of Food Drug and Cosmetic Act, also known as Pre-market Approval, recommends device and kits manufacturers to mandatorily register and notify FDA of their intent to promote their product at least 90 days in advance. 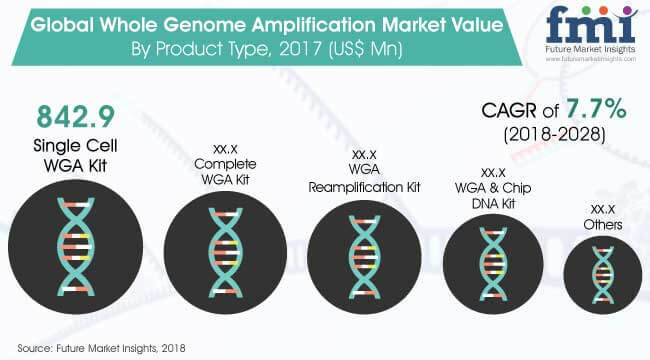 These improvements are projected to bolster the growth of the global whole genome amplification market. The research community has to cater to evolving needs, which in turn requires manufacturing of special custom products. The demand for specialized tools and reagents has grown to the point where most vendors currently offering these products cannot depend solely on the sale of the catalog products. The custom requirements demand special time management which depends on the vendor choices. Research users tend to prefer tried-and-tested solutions for their custom reagent needs to avoid the time and effort to validate custom products prior to use in critical experiments. The process of WGA involves extraction, amplification and sequencing. The PCR-based WGA andREPLI-g technology have different results. Single base-pair mutations, STR contractions, and expansions, and also biased and underrepresented loci are involved in PCR WGA. Whereas, REPLI-g technology, which uses MDA technology and Phi 29 polymerase, delivers highly uniform amplification across the entire genome with minimal locus bias during amplification. This leads to a lack of trust on the process, which declines the revenue of whole genome amplification market. FMI utilizes a triangulation methodology that is primarily based on experimental techniques such as patient-level data, to obtain precise market estimations and insights on Molecule and Drug Classes, API Formulations and preferred modes of administration. Bottom-up approach is always used to obtain insightful data for the specific country/regions. The country specific data is again analysed to derive data at a global level. This methodology ensures high quality and accuracy of information. 18.4.3. Thermo Fisher Scientific Inc.